Alexa Chung is Longchamp’s latest woman in motion. 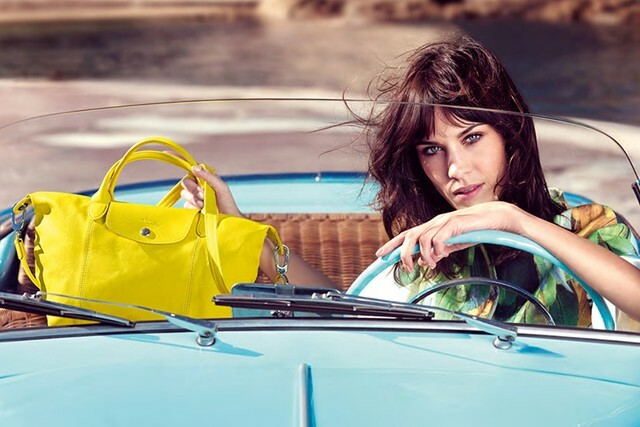 The French leather goods firm tapped the vivacious “It” girl to front its spring campaign — the first volley in a year’s worth of events to mark the 20th anniversary of its best-selling Le Pliage bag. Spots showing Chung frolicking around Saint-Tropez — occasionally behind the wheel of a vintage Fiat convertible with unusual wicker seats — are to break in select February magazines, including Taiwanese Elle and American and British Vogue. Max Vadukul shot the print ads with Alexis Roche as stylist, while Jean-François Julien did a short film that will make its debut during New York Fashion Week on social media and as digital advertising.